In the third part of our East Asian Cup preview, we look at East Asian giants Japan, who despite a turn around in form since their drab exit in Australia 6 months ago, have returned to their blunt selves with a frustrating stalemate against Singapore at the start of World Cup qualification. Martin Lowe looks ahead to a tournament that will likely see experimentation at the forefront of Vahid Halilhodzic’s mind as he runs the rule over a number of highly-rated domestic starlets. It’s not been a highly memorable year for the Samurai Blue. Twelve months ago they crashed out of the World Cup without registering a victory, while in January’s Asian Cup they couldn’t meet their lofty expectations of being pre-tournament favourites, dropping out in the quarter-finals. To make matters worse, an anticlimactic home draw to start World Cup qualification last month signalled another false dawn. Each of these events have been entered into with high hopes with three separate managers who oversaw their side falling way short of what is expected back home. The results themselves haven’t been too miserable since last summer, with their only regular time defeats coming to South American heavyweights Uruguay and Brazil in friendly competition. In non-competitive action the same effectiveness has still been on show since Halilhodzic has taken charge, leading Japan to three comprehensive friendly wins from three ahead of their return to World Cup qualification. At the moment, the concern seems to stem from crucial competitive encounters. The three crucial results of this period have all finished 0-0 (v Greece at the World Cup, v UAE at the Asian Cup and v Singapore in World Cup qualification). In each fixture they failed to invent any real opportunities in the final third for the isolated front striker, making it too easy for their opposition to fix two banks of four in front of their own goal and grind out the clean sheet. Questions have been asked of the glitzy names that rarely turn up on the big stage. For all his ability, Shinji Kagawa hasn’t truly performed on the competitive stage for a long while, if not at all, since that memorable match with Italy at the 2013 Confederations Cup. Elsewhere, there has been a persistence in using players on their hype alone, over untried domestic treasures such as Manabu Saito and Yoichiro Kakitani (at the World Cup), and Yoshinori Muto and Gaku Shibasaki (at the Asian Cup). In this regard, Halilhodzic has been quite firm. Numbers of domestic players being given their chance in the starting lineup have risen, while he’s made tough choices on international legends Yasuhito Endo and Yasuyuki Konno, preferring to look beyond reputation to current form and future potential. His East Asian Cup selection reaffirms his priority to promote youth and domestic form, with the likes of Urawa Reds duo Yuki Muto and Yosuke Kashiwagi selected over more experienced options such as Toshihiro Aoyama and Yoshito Okubo. There’s no excuse really when you look back at Japan’s struggles to break teams down when you consider the options available. Outside the regular European based crop, the J.League debutants have plenty to offer. The experimentation over the last 6 months suggests that Yoshinori Muto and Takashi Usami will fight for the last available attacking birth, but as was the case at the last East Asian Cup where relative unknowns Hotaru Yamaguchi and the aforementioned Kakitani came to the fore, an unfamiliar face could well be the missing piece Halilhodzic and Japan have been searching for. Key Question – Are these upcoming J.League gems set to shake up the Samurai Blue? The gap between those guaranteed European based starters (Honda, Kagawa, Hasebe, Yoshida) and the J.League base has been considered greater than it actually is for a long while. Their underachievements on both continental and global stages has prompted some to call for a shake-up in the national team selection criteria. Position by position, the defence is an area in which we could see this the most. Lack of playing time in Europe gives those new call ups a sniff of a regular position if they can find form. Kosuke Ota is quietly becoming one of Hallilhodzic’s favourites at left back, while a strong showing from a Makino-Morishige partnership could prove its worth over an occasionally ring-rusty Maya Yoshida when he returns. Depending on their success at this tournament, the J.League could finally illustrate its growing merits. 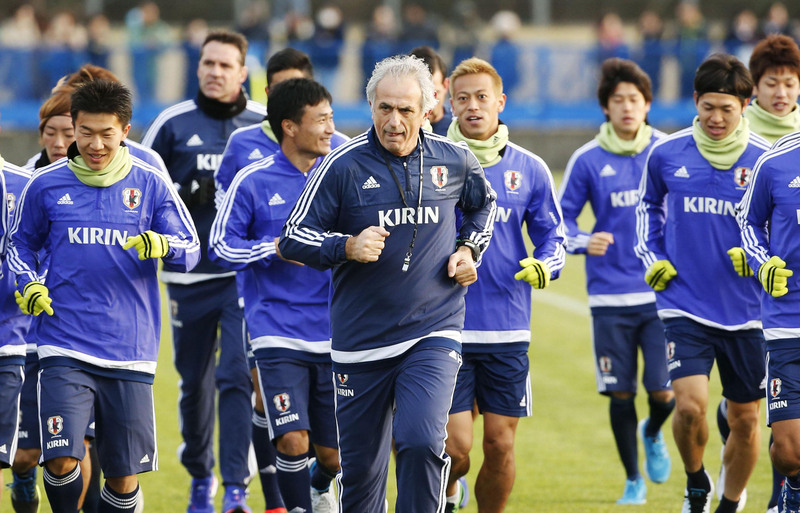 It might only seem months rather than years since Masato Morishige was integrated into the Japanese squad, but responsibility will be felt heavily on his shoulders going into this tournament given Halilhodzic’s inexperienced selection. His ability has never been in question but he’s at times found it hard to nail down a starting spot, one constraint being his flexibility. He was given his first chance under Zaccheroni at the last East Asian Cup, but the Italian ultimately went for an easier, more experienced option in Yasuyuki Konno at the World Cup. Fast forward a year and Konno, despite another solid season with Gamba, has been dropped in favour of a new breed. Further trust will be flung Morishige’s way in the absence of Maya Yoshida who usually commands the Samurai Blue back four. This truly could be the making of a defender, in the prime of his career. Much of the early transfer talk in East Asia speculated over the future of Japan’s new darling, in some quarters the predictably-dubbed “Japanese Messi” Yoshinori Muto. Behind the hype that clearly fizzled in the public consciousness, Yoshinori’s name sake Yuki Muto has more than justified himself as one of the top players in the J.League in the first stage, at the very least the top Muto. His potential may be a tad lower than the usual selection. However, the floating support striker’s form has been too difficult to ignore, and he truly deserves his place in the squad going on to likely make his debut in the coming week. His movement, great interplay and his improving eye for a goal make him a dangerous weapon in Halilhodzic’s armoury, one he’s not going to be afraid to utilise.